I am exhausted. For the last three days, my work program’s HQ in Tokyo has been working tirelessly to disseminate information about charities, radiation, and preparedness, and I have been trying, in my own small way, to help get accurate information out on our prefectural blog and twitter. When the earthquake hit, I was sitting at my desk at work. I have not been sleeping well lately, and I started to feel dizzy. At first I thought I had the exhaustion-and-caffeine jitters like I had last spring. My desk felt like it was moving–but I hadn’t filled my coffee cup that afternoon. I looked up. Everyone in my office was looking around. 「揺れとる?」 (Are we swaying?) one of my colleagues asked. We stayed in our seats and looked around for evidence that we were shaking, but we couldn’t find anything to prove it (a hanging lamp, for instance). One of my coworkers got online and said it was an earthquake. I hopped on the Japan Meteorological Agency’s site, and sure enough, we had experienced a magnitude 1 quake. I started writing a post for the prefectural blog saying that the earthquake was only a 1-2 in our prefecture (as friends and parents are wont to worry) and that we were all fine–and then the news started coming in. 7.9 in Miyagi. Tsunami warnings for Miyagi and Fukushima. An advisory for us. The news in Japanese took a few minutes to get going, and the first place I got confirmation was actually Sanspo, of all places. The English news on Google was all over the place, and the information was conflicting. And then the emails, the facebook messages, the tweets, and the texts poured into my inboxes. I spent the rest of Friday typing “We are fine in my prefecture” over and over while it became very obvious that the situation in Miyagi and Tohoku was anything but. Where do you get accurate news on a disaster? The American news sources seem to be sensationalizing things, while NHK urges us to remain calm. The commercials on TV have been replaced with ads telling us to be good to each other and help each other. On Sunday, I biked to the bank and donated to the Japanese Red Cross. I went to the co-op and the grocery store. Because it was Saturday afternoon, the store was full of food and people, and it felt like nothing bad was happening at all. I actually really love grocery shopping, providing I have sufficient income, and there were so many interesting things there–cheap apples from Nagano, wheat germ, organic mikan juice. (But no limes.) I stayed in the store far longer than I intended because it felt so normal in there. The sun was shining, the weather was nice, and it felt good to be alive. It is good to be alive. It is good to be here on my little corner of the middle of nowhere. On Monday, after the tsunami warnings had been lifted, I took my bento box outside, walked down to the harbor, and ate my lunch there to spite the sea. It was 16 C out with a strong spring breeze. 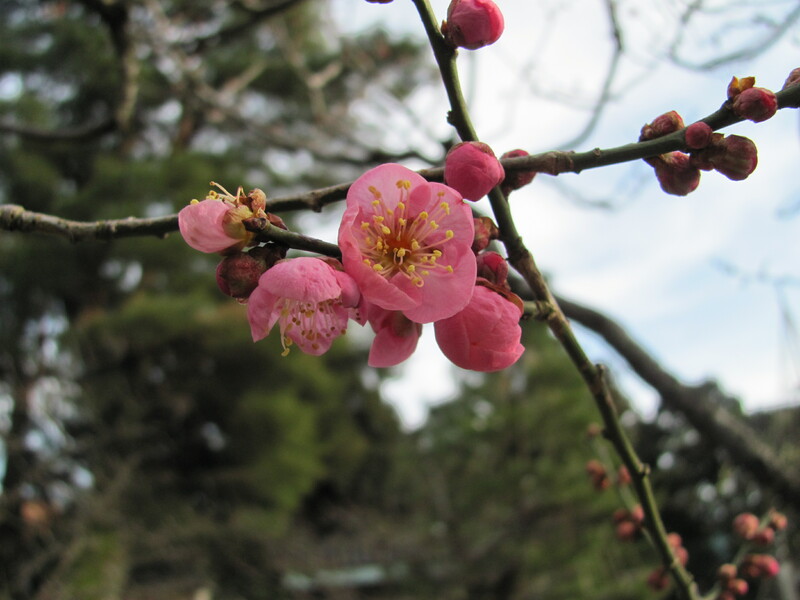 I found a blossoming plum tree at the shrine. Back at my apartment, my potted chives finally sprouted, joining the basil plants I am growing. I’m alive, so I need to help others. For now, the best thing to do, if you are not a member of the SDF, army, or Red Cross, is to donate your money, goods, and time to the relief effort. NAJET has a list of domestic and international relief funds and how to donate. Not listed is Second Harvest, which comes highly recommended from the expat community there. If you have information on survivors, you can search and post it on the sites linked here. Remain calm, and stay safe.